Today I’m honored to introduce you to Haile Thomas, health advocate and the founder of the Happy Organization and the host for the YouTube channel Plant Powered Haile. 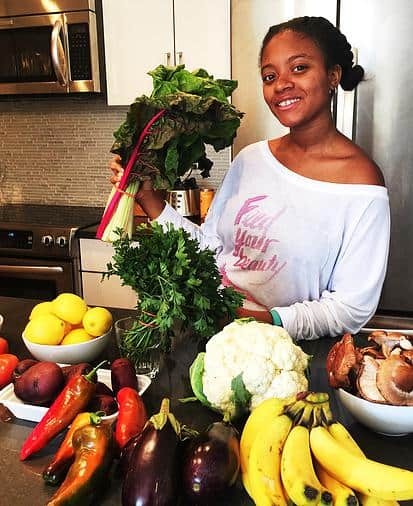 Now at the ripe old age of 14, Haile hasn’t slowed down in her mission to bring plant-powered health education to kids everywhere. Haile is one of the Animal Hero Kids I introduced in my recent video with that organization’s founder, who awarded Haile with the Paul McCartney Animal Hero Kids Young Veg Advocate Award this month, adding to her already impressive resume. Haile shares about how this family health scare turned victory inspired her to take action on a broader scale. “After we had really had this health revelation it was kind of where I was learning that kids were getting type 2 diabetes and heart disease and becoming obese and all those things. And I really started to think that maybe if we hadn't become healthier I could have gotten type 2 diabetes or any other health related disease. So, I just kind of started freaking out like ‘oh my gosh not a lot of kids know this'. There's all these documentaries and information out there but nobody's really telling them about it. So I kind of went to my Mom and it was like “O.K. I want to do something. I want to tell the kids at school. I want to tell anybody who will listen”. So, from there we discovered the Alliance for a Healthier Generation which is a Clinton Foundation initiative and I just applied. I was only 10 but, I didn't really have a lot of things underneath my belt. They gave me a lot of opportunities to talk to lots of adults and kids about how kids and adults should work together to try to get kids eating healthier and moving more and all those things. For a few years I was just traveling the country giving speeches and talking to kids doing cooking demonstrations. I was on the Food Network promoting healthy foods and just different appearances and all those things. I worked with Hyatt Hotels to reinvent their kid's menu so that it was healthy, sophisticated so kids really felt appreciated on the kid's menu. I did all of that for a few years and then I started to realize well O.K. I am doing a lot of things that are catered towards kids who kind of know this information and kind of already have the concept and so I started thinking about how in my community a lot of under-served areas just don't have access to places where they can get all this information for free or for very low cost. So, that's kind of when I went to my Mom and was like “Hey do you want to start an organization?” and she was like “O.K.”. We worked on developing a name and we chose HAPPY because it stands for Healthy, Active, Positive, Purposeful, Youth. And so we work on each of those sections and we've had the organization for almost 3 years, which is really great. We've reached over 5000 kids between classes and just really educating kids on nutrition. It's been very interesting to see the transition in our curriculum for sure as our knowledge of food and health has changed over time. One aspect of Haile’s mission is helping kids connect with their food sources and empowering them to take charge of their own health. “I think that for a lot of kids they just don't realize that they really do have power over their health. [tweet this] I think that at a certain level just like, ‘whatever my parents buy for me is whatever it'll be' and that's not necessarily true if you really are educating yourself about it then you can go and educate your family about the benefits of eating healthier. We definitely work to just empower kids to know where their food comes from. When I asked Haile what the most rewarding experience in all of her work has been, she said she had two. “The first one, I would say, is when we're teaching the kids in our classes and you kind of see this light bulb go off on the kids’ faces and you can really see that they just made a huge revelation in their heads. And it's like you really see how they were just begging for a bag of Cheetos and now they want carrots. Once you just see that transformation and when that happened it really amazing. We had one summer camp, last summer, where we were teaching kids about what were in hot dogs and the kids were just so grossed out by it and they all wanted to watch the video over and over again. The next day we took them to a field trip and we just so happened to have a pit stop at the meat department and the sampler person was like “Oh, you guys want some hot dogs?” and in unison they all said “EEEEWWWWW!”. So, it was like, it was just so awesome to see that they really retained that information that they learned and once they saw those hot dogs they were like, “We know what's in there”. I think that is always really rewarding. Haile has certainly accomplished a lot in her 14 year, not the least of which was leading her family from their new healthy way of eating, to full blown veganism. “It's actually funny when we first went vegan I kind of, like, challenged my Mom and I like blasted her on Facebook to be a part of the challenge to go vegan until the end of the year last year. So, obviously we lasted way longer than that but at first when I said that to my family everybody just looked at me like I was crazy, like “What are you talking about? How can we give up our chicken and our fish and all these things”. If you want to find out more about Haile and follow her work, check out all of her links below! Haile is a powerful force for the health of future generations, for the lives of animals saved by more people eating more plants and for our planet so ravaged by animal agriculture. Having accomplished so much in her first 14 year on this planet, I can’t wait to see where she goes from here. Stay tuned to the channel to hear from more Animal Hero Kids. If you liked this video, do give it a thumbs up and share the post around to help show what kids can accomplish! Haile Thomas is a very remarkable young girl. Very intelligent too for only 14 years old. Nice to know the future for animals is in very good hands with compassionate people like Haile. So agreed! She’s a phenomenal leader. phenomenal! What an incredibly confident and clear girl.. I am wondering, do you think there are more children waking up to veganism now than there were let’s say 30 years ago? I recall during my own childhood, I never once met another child who talked of compassion for animals, all of vegetarianism, and certainly not veganism.. It is so great to hear that people find these things at such an early stage in life, and I’m wondering if it was always that way for some, or whether this is a more recent phenomenon.. ? Any thoughts?